I’m so bean-overloaded tonight 🙂 Let me start with saying “you must try this bolognese”. I wanted to have something hearty after a stressful day. Bolognese and socca was a first thing that came up in my mind. Easy enough, I already had ingredients in hands including soaked beans. I’m not normally a bolognese person and was also skeptical about making a vegan version of it. However, the smell, flavour and texture of this bolognese is surprisingly no different to a conventional recipe and even better (I dare to say). Nutritionally, you have a good amount of whole grains and vegetables in one bowl. I used two types of beans, mung beans and adzuki beans, for different texture here. Lentils will work really well too if that’s what you have in pantry. I also used a back of spoon to mush beans once the sauce was thickened instead of blending, which will give you a more meaty texture. Even meat eaters will get pleasantly surprised by the fact that there is really no meat in this dish. It is kept well in freezer so feel free to double up the recipe and keep the leftover in freezer for later use. Drain and rinse soaked mung beans. Cover with cold water and bring it up to a boil. Simmer on medium heat for 15-20 minutes until cooked. Take it off the heat, drain and set aside. Heat a frying pan over medium heat. Add coconut oil and chopped onion into a pan. Stir and cook until translucent and fragrant. Then add beans and all other ingredients into a pan and simmer on low heat for about 20 minutes or until the sauce is thickened. In the mean time, use a vegetable peeler to make zucchini noodles. Season and dress with olive oil. You can leave the bolognese sauce as it is or blend it up if you want a smooth texture. 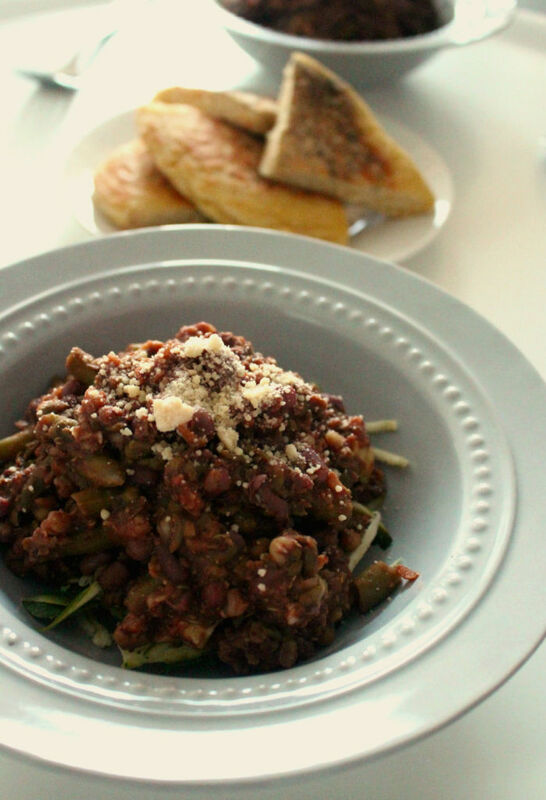 To serve place zucchini noodles into bowls and then ladle the bolognese sauce on top. Garnish with Parmesan or nutritional yeast and a drizzle of olive oil.